The stage lights are off and the catwalk is long gone since Fashfest 2015 but for designer Charne Esterhuizen from Maak the momentum hasn't stopped. I find this woman highly inspiring, passionate and inspirational. At a young age of 16 Charne moved to Australia from South Africa and instantly saw that there was so much opportunity and potential here. She began fashion in year 11 and has since fallen in love. 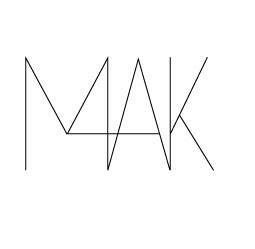 At only 22 she has completed fashion at CIT, held a position as a fashion director for a clothing manufacturer and now owns and runs her own label Maak. Having only created and launched her label this year, the 2015 Fashfest fashion festival was the first time Charne showcased her label. Charne wanted to experience and participate in the show first hand and immerse herself in the experience. “The lead up to Fashfest was intense. Every designer goes through it. You can’t eat or sleep much as you are focused on designing and sewing 24/7”, recounts Charne. It’s worthy to note unlike some labels Charne does absolutely everything this includes, PR, design, pattern making and sewing. It is clear that her passion drives her and gives the much needed energy to do something like this. Having attempted to make garments myself and unpicking more than I sew I find this amazing. I can also say that from viewing her range at Fashfest she isn't one to disappoint. Her collection is cohesive and very wearable meeting her objective. The garments are clean lined but up close you will see layers, texture and finer details. As a designer Charne recommends in participating in events like Fashfest and RAW to challenge yourself and to help create awareness and build networks for your brand. “Canberra has great potential it is small so everyone knows everyone. I see this as a benefit especially since my brand is still in its infancy”. As natural go getter I asked Charne where she hopes to be in the next five years time. “Currently I am focusing on designing my next collection and in five years time who knows I want to aim for international recognition”. I was also curious to ask what the creative process is for Charne’s collections. “Every collection of mine has a different story. I design it so that it revolves around people and what they do”. “Naturally I am a people watcher. What they do it intrigues me and how they react in different people and environments”. “The current collection is based on how loud a personality can be. I wanted to explore personality types through my colour range from white, peach , green to black to black. White signifies the shy unconfident person whilst the black is lets go out let’s go party personality type. I’m looking forward to Charne’s next collection which will likely take some inspiration from her recent trip to Hong Kong. As I am interested in sewing and design I asked for some advice as a parting question. If you don’t know what you are doing research before you do it! This will reduce wasted time, tears and budget blow out. When designing be fearless and take risks, this is a part of the experience.